According to his public defender, James Gleich “suffers from severe anxiety and panic attacks that render him helpless” as well as a brain injury from an accident in which a door fell onto his head in 2001. He takes a variety of medications for these problems. 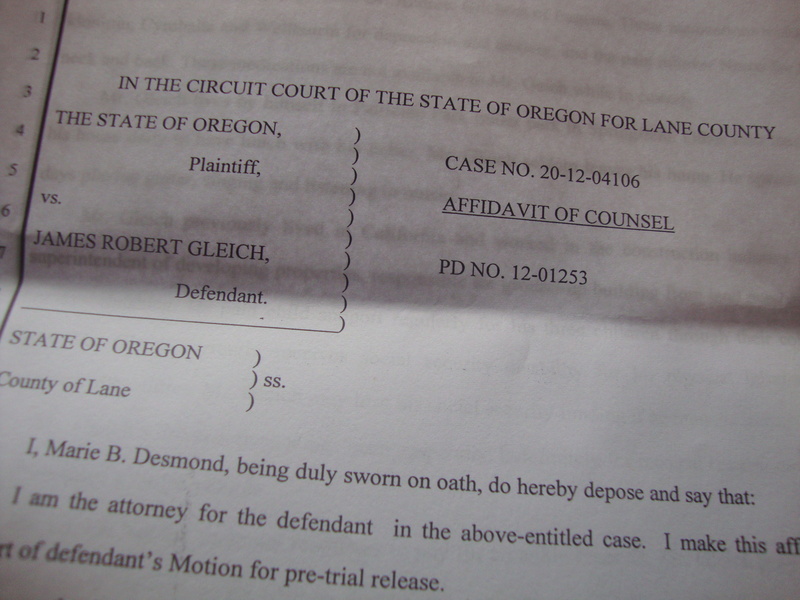 This information is included in an affidavit about Gleich that was filed in court by his lawyer, Marie Desmond, in efforts to get Gleich released from jail. Gleich, you may remember, is charged with manslaughter, criminally negligent homicide and reckless driving in the crash that killed Mingo Shay Pelkey as she waited on her bike to make a left turn off of River Road last August. It was his third automobile wreck in about 10 weeks. The judge set bond at $50,000, and Gleich was released from the Lane County Jail on March 9 after his father paid $5,000, 10 percent of the bond amount. He had been in jail for close to two weeks, after being arrested on Feb. 26. Now he is on electronic surveillance, is not supposed to leave his home and must wear one of those ankle bracelets that alerts the sheriff’s department if he does. He “suffers from a painful physical injury that occurred when a fire door, improperly installed, fell from a third floor landing onto Mr. Gleich’s head. He suffered brain injury and several crushed vertebrae since this 2001 accident and remains in substantial daily pain,” Desmond writes. The affidavit says that Gleich takes three separate psychiatric medications, as well as a pain reliever called Norco, which is a mix of acetaminophen and hydrocodone. Gleich used to work in construction in California. He now receives Social Security disability payments. “Gleich’s driver’s license has been suspended indefinitely for medical reasons, and he no longer operates a motor vehicle,” Desmond writes. Let’s assume this is an accurate account, and not overblown (not to cast aspersions on his lawyer, but it is her job after all to put the defendant in the best possible light). If it is accurate, things would be starting to make a little more sense here. Well, no, it’s still senseless. But since this all began I have wondered what had to happen for a guy who is 53 years old and had no criminal record that I could determine, to suddenly have three traffic wrecks in 10 weeks, one of them fatal. If all of this is accurate and true, I might even muster some sympathy for James Gleich. Don’t get me wrong. I’m not going to suggest he be absolved from personal responsibility just yet. I’m sure there are more details that will come out. Why was he licensed to drive in the first place? Do we make it just too damn easy to get a drivers license? Or do we just not take seriously enough how dangerous an automobile is? And another question: Are our land use patterns and transportation infrastructure set up in such a way that someone who can’t or shouldn’t operate a motor vehicle (for whatever reason) can still be a functioning member of society (getting to work, running errands, getting from place to place as needed, etc.)? She is right. I see bicycles pull out in traffic all of the time. You responded to your own comment? … In the third person? Or else there is someone else named Ann out there who is using your same e-mail address. A friend who has witnessed bicycles roving across roads does not have internet access so I write on his behalf-I suppose you might call it hearsay. 1. Where have I “absolved cyclists of their chronic failure to yield”? 2. Where have I promoted “careless bicyclists roaming” in front of traffic? 3. Where have I suggested it be the norm that cyclists ignore traffic? I certainly don’t ignore traffic. I certainly don’t trust my safety to a “magical angel.” Believe me, I’ve been riding my bike around long enough to know that people driving cars may or may not be looking out for me. I’ve criticized bad cyclist behavior on this blog a number of times. And I’ll be the first to say it annoys me to see cyclists riding through red lights and whatnot. I think you are confusing this issue, oversimplifying it. You watched a cyclist do something stupid, perhaps. So it’s easier, right, to just criticize everybody who is on a bike? I see people in cars break laws and be irresponsible all the time. How many motorists violate the speed limit? How many are talking on their cell phone? How many drink and drive? But, look, I’m not trying to say people who drive cars are all irresponsible. No, in fact, my experience has been that most are fairly careful and considerate. People are people, whether they are on bikes or in cars. I don’t appreciated being judged by some other cyclist’s behavior. Anyway, this comment comes on a post regarding a case in which a woman was hit by a car and killed. The information at this point would indicate to me — and this is my opinion, sure — that she was doing nothing wrong. And the Lane County district attorney has decided there is enough evidence to charge the driver of the car with manslaugher. He has not been convicted of anything at this point, so we will wait and see. There are some people, I guess, who believe bicycles should not be on the road at all. That roads are for cars, dammit. That bikes should be confined to bike paths and sidewalks. I don’t agree. Neither do the laws of the state of Oregon. Are there risks? Absolutely. But the answer isn’t getting rid of bikes on the road. It’s figuring out how to get people to operate their vehicles — whatever kind of vehicles it is — safely and responsibly. On hearsay, no one knows what happened to the nice vehicle, the Eugene piece called it totaled and the Eugene police had it last- it was still running. On hearsay, some DA destroyed all of the evidence. Wierd. What is true anymore? You state in one of your remarks “Weekly I see 2-3 situations of bicyclists Pulling Out in Front of traffic.” 2-3 situations per week. I see motorists do that in 10 minutes. You are entitled to your opinion, you are entitled to speak your mind, but I find it disgusting, insensitive, and selfish to insist and argue about bad bicyclist behavior after an article regarding a totally innocent person who was killed by a man who shouldn’t have been driving at all (we don’t even have to wait for a conviction to know he shouldn’t have been driving, his attorney’s already admitting it). I so want to be rude to you… and more. It’s really hard not to be. But it won’t do me any good because nothing anyone says or does is going to change your mind, which is made up: Bicyclists are bad guys. Bicyclists cause trouble. Bicyclists ask for getting maimed and killed, no matter any other circumstances. Bicyclists are stupid. Bicyclists have no right being on the road. Why are YOU so upset about bicyclists that you have to beleaguer your view to such a degree? I know why I’M so upset with people with attitudes like yours: my son was killed 8 months ago on his bicycle while riding in a bike lane. And it really offends and hurts me that people like you feel compelled to say out loud, with no concern whatsoever of the effects on already devastated family members, that it’s all the bicyclist’s fault. No matter if the driver was drunk (double the legal limit), speeding, driving in the bike lane (for 3 blocks), AND hit two legally-riding bicyclists before speeding off, leaving one dead and one injured at the scene. You are right: it wouldn’t have happened if the cyclists hadn’t been there. But they were, so they asked for it. I do see bad behavior on the part of cyclists, and it really bothers me, especially now. I also know it’s sometimes hard to know what the proper thing to do is when sharing the road with a bicyclist; it can be very stressful. But with so many drivers running red lights and stop signs, speeding, tail-gating, changing lanes just because they want to be in front, talking/texting, driving with dogs on their laps (I have seen this twice in the past week), etc., while operating a 4000 pound vehicle… you want to focus on the dangerous bicyclist. Really? Those in cars kill many more other people in cars than they do scofflaw bicyclists. Maybe you don’t realize that…. (Oh, and by the way, cyclists also get killed on sidewalks and “quiet streets”). Thank you for your heartfelt and passionate comment. For anyone who doesn’t know who Kristi Finney is, BikePortland has reported on the work she’s been doing in Portland since her son Dustin’s death. You can also read BikePortland’s report about the sentencing of the young man who hit and killed Dustin — and what I thought was a remarkable statement Ms. Finney made at that hearing. Bicyclists ignore the fact that they are more like a pedestrian on wheels than a 2-4 ton piece of machinery which is moving at a velocity. Do we want to sink into prejudice rather that reason? Then what drugs do bicyclists use, how many are on anti-depressants ? which ones are thinking about their destination rather than those process? Which ones are riding bikes through streets with mental physical disabilities and impairments and put all of us in danger because they pull right out in front of traffic, constantly, all over these cities, in the U of O area-where they always race out in front of traffic trying to beat the traffic that weighs 2-4 tons. Bicyclists set a bad example for the children in this community by ignoring the logic of yielding to vehicular traffic. Well, shouldn’t there be a special responsibility involved in operating “a 2- to 4-ton piece of machinery … moving at velocity”? That a lot of momentum to be responsible for. No, actually, I don’t believe that just anyone should licensed to drive a car. I had a beautiful silver Motebecane-a French bicycle, my first bicycle. An ain’t sent me 300.00 in 1979 to buy clothes and I bought a bike instead-THIS is fact, not hearsay. My bike was stolen from the front of Porters foods (currently KIVA) in the summer of 1981 while I worked there. Many years later, I saw it parked at Steelhead older but just as beautiful. Does this seem off of the subject-it’s not. This is about the wonderful sense of freedom and flight that comes with riding a bike, using your own energy to move forward in space and time. Slowing down or stopping to see things. I could ride fast. I could leave my job at 11th and Charleston and be at my address near 18 and Pearl in 5 minutes at lunchhour traffic. People on the homepage told me I should race. I was so fast. When my beautiful bike was stolen, I was sad. Then I was philosophical. I had been taking chances riding in traffic the way I did-but I had felt such a sense of freedom, like wings or the wind.. Just the joy of riding that bicycle. This is a case of a cyclist following the rules and waiting in the left-hand turn lane to turn left. Maybe if she’d broken the law and turned earlier she would still be alive. Ann is clearly someone with an agenda who things people on bikes don’t belong on the street. We get your point. Now have some respect for what this post is actually about. It’s about a case that is 100% the car driver’s fault. If I recall correctly, with TBI a doctor has to sign something saying that the person can still drive. If that happened, then the doctor should be partially liable for the three accidents. I don’t have an agenda. Weekly I see 2-3 situations of bicyclists Pulling Out in Front of traffic. : a young man a on Harlow going east pulls out in front of the car traveling east. Then he pulls out in front of moving traffic which is traveling west so that he can make a left turn. I could go on describing situations but this blog is about 1 incident not 3, not similar incidents. By the way. Dammit, bikes have just as much right to be on the road as runners, horses,, etc. yielding to moving traffic only remember that they are ‘entitled’ to those parts, the whole part of the road-whenever, wherever. You’re self- motivated agenda perpetuates this ‘dangerous’ sense of entitlement among bicyclists because they listen to your voice about what thier rights are. Start to emphasize those responsibilities. I think I smell a troll, here, but I’ll bite anyway. Ann’s attitude toward bicyclists is part of the problem with using bikes for quick and efficient transportation as opposed to Sunday strolls along the river. Can you imagine doing a 7 mile commute on sidewalks? Forget for a moment the dangers involved with cross traffic at driveways and cross-streets; pedestrians have every right to stone someone doing 10-20 MPH on a sidewalk. Most of what Ann seems to promote is that it isn’t ok to take a lane in order to make a left turn because if the cars behind don’t stop, the bicyclist will get killed. This argument fails both legally and logically. For instance, continuing with this logic Ann shouldn’t be driving her car on roads with semi-trucks, garbage trucks, dump trucks etc. The laws clearly disagree with Ann’s belief. There’s no use in even arguing it. Bikes have the legal right to take a lane for a variety of reasons. As for Ann, if you are unable to follow the law while driving, get out from behind the wheel. You can bike, walk, ride your horse or whatever, but at least if you screw up you won’t kill somebody else. I make observations as do other people. I have opinions and formulate and think. I admit freely that I am not always right about things. But of this I am sure. Eugene Cyclists has positioned themselves to support the rights of cyclists and they are in the best position to support cyclists in understanding safe rules of the road. I watch out for all vehicles, bikes people and animals on the area of the roads. Your immature response to my rational concerns about road safety is noted. Of course bike travel is necessary. I have often ridden my bike to and from work groceries. A better understanding of safe riding/driving can be developed by the Eugene Cyclists because they have a strong and respected community voice. Bikes darting out in front of traffic and weaving through stopped traffic is unsafe. Do you think that is safe? And I am done here, best people to promote this understanding of safe riding habits are the knowledgable and reflective bicyclists. Consider taking a class from GEARS on how to ride safely. Riding on the sidewalk isn’t safe, because entering a crosswalk at bicycle speeds is extremely dangerous. It doesn’t take much time to learn that a driver who you make angry is much better than a driver that doesn’t know you’re there until after they’ve hit you. Your comments are one sided and based solely on “hearsay” of supposedly what happened. Did you actually witness the accident that is being discussed here? NO! Have you read the accident reports? Have you seen any of the evidence? Have you spoke to any of the eye witnesses? If not maybe you should just keep your comments to yourself! By your comments, it is quite apparent that you are unreasonable and use no logic. Maybe you yourself are using medications that are impairing your sense of reason and logic. By the way, I am not a cyclist. But can clearly see that based on what the DEFENDANTS attorney has said (that he is on medication and has been in 3 motor accidents in 10 weeks, one in which killed Mingo).. that man should NOT have been on the road driving.. PERIOD. And as for you stating what you have seen other cyclists do.. that has ABSOLUTELY NO bearing on THIS case. Just because one cyclist may not obey the laws of the road, does NOT mean that EVERY cyclist does that. In this particular case, she WAS obeying the laws.. and got killed for it! So get your facts straight before deciding to post comments and opinions based on “hearsay”. Oh and maybe you should pray to be more compassionate for the family involved (and in general), because maybe someday you will need compassion given to you!